I know almost nothing about him. 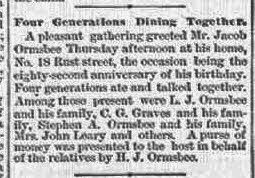 He showed up on the Oakwood Cemetery [Syracuse, Onondaga, New York] cemetery burial register as the father of Jacob ORMSBEE who died aged 86 years 9 months on 29 Mar 1893, in Syracuse. Actually, it states Jacob's parents were Arnold and Hannah Ormsbee. News to me! Finding any information about Jacob's parents in the late 1700s and early 1800s has been challenging. A pleasant gathering greeted Mr. Jacob Ormsbee Thursday afternoon at his home, No. 18 Rust street, the occasion being the eight-second anniversary of his birthday. Four generations ate and talked together. Among those present were L.J. Ormsbee and his family, C.G. Graves and his family, Stephen A. Ormsbee and his family, Mrs. John Leary and others. A purse of money was presented to the host in behalf of the relatives by H.J. Ormsbee. My ancestor line goes through Charles Giles GRAVES and wife Harriet P. ORMSBEE. The names in this notice allowed me to add several people to my Ormsbee family line, adding more children, marriages, and a brother to Jacob. So, Arnold ORMSBEE, or Ormsby, and details of his family as seen in 1810 and 1820 censuses, Manlius, Onondaga, New York, remains somewhat a mystery. Manlius was settled in the late 1700s, and is just east of Syracuse NY. The 1810 census shows 4 males, 4 females in the household, with the eldest female ticked in the 16-25 column. This is very confusing, since there is a teen male in the 10-15 column and I'm unable to think a 25 year old woman would have a 10year old son (or older!). Three females are under 10. Is the female in the 16-25 yrs column actually his wife? a second wife? or perhaps she's an eldest daughter, i.e., Arnold is widowed? The 1820 census adds more children. Note the first 6 columns are for males [4th column states males over 16], next 4 columns are for females, and the far right tick indicates he is involved in 'Manufactures' in some way. Once again, the older woman in this household seems too young to be the mother of all the children. And what was Arnold manufacturing in the small village of Manlius-? Curiouser and curiouser. The only other document I've found, which could be relevant, is for an Arnold Ormsbee & c, [plaintiff] Court Judgment concerning $71.66 re Robert Pearsall, who did not show in court. However this was in Delaware County New York (county seat, Delhi in northern part of county), over 90 miles away. Could it be for "my" Arnold? A very thin thread here, isn't it! So far I haven't found additional news for any other Arnold Ormsby/Ormsbee. If you have ancestors in this Ormsbee line, or know further information, I would love to hear from you via calewis at telus dot net, as my Blogger account updated and stopped me from being able to actually 'reply' to your comments. Thank you so much for stopping by and reading this post. This year, I've taken a break from posting, but I will be doing more in the coming months and years. Cheers!